OP11 Introducing FABER test for allergy diagnosis: food molecule- and extract-based allergenic preparations in the newest and broadest nanotechnology IgE test Adriano Mari1 , Claudia Alessandri1 , Ivana Giangrieco2 , Lisa Tuppo2 , Chiara Rafaiani1 , Georg Mitterer3 , Michela Ciancamerla1 , Rosetta Ferrara1 , Maria Livia Bernardi1 , Danila Zennaro1 , Maurizio Tamburrini2 , Maria Antonetta Ciardiello2 , Christian Harwanegg3 1 Centri Associati di Allergologia Molecolare – CAAM, Rome, Italy; 2 Istituto di Bioscienze e Biorisorse, Consiglio Nazionale delle Ricerche, Naples, Italy; 3MacroarrayDx, Vienna, Austria Background: Multiplex tests allow to detect specific IgE to several different preparations at once. They allow patient’s profiling tailoring decisions for interventions. The last ten years have seen the availability of new technologies and when combined can lead to increase diagnostic information from allergy tests. 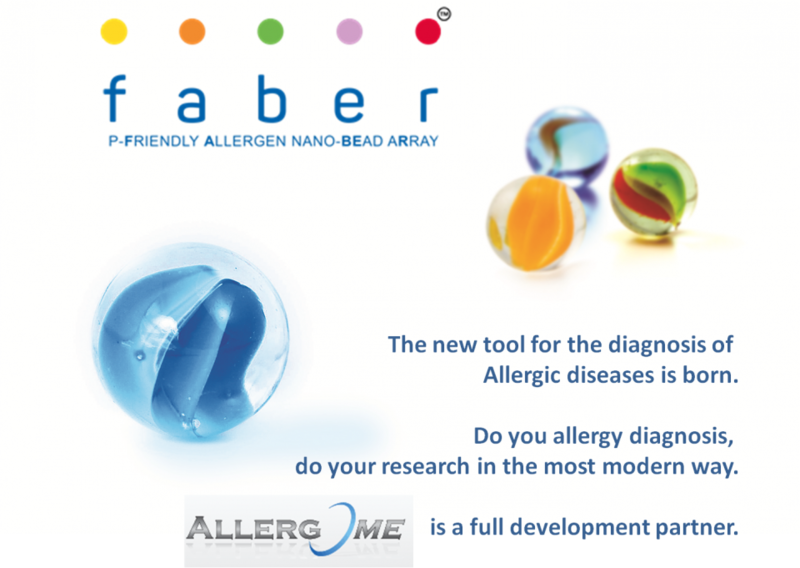 Aim: To report about the FABER nanotechnology-based test in food allergy diagnosis. Methods: FABER 244 IgE test is a new multiplexed in vitro test for specific IgE measurement having 122 molecular allergens and 122 allergenic extracts. Allergenic molecules and extracts, produced in house or obtained from top quality providers in the field, are coupled to chemically activated nanoparticles. Coupling is individually optimized to achieve maximum test performance providing high diagnostic accuracy for each spotted allergenic item. Once coupled they are arrayed to a solid phase matrix to form a one-step comprehensive array based testing solution, using 100 ul of patient serum or plasma. Results-Discussion: Extracts from 91 food-borne allergenic sources (fruits, vegetables, eggs, milks, meats, fishes, crustacean, mollusks, snails, mushrooms, anisakis) are arrayed together with 66 allergenic proteins obtained from the same sources. CCD-bearing proteins are included as markers to support test result interpretation, as well as allergenic molecular groups which cross-sectionally belong to food and inhalant sources. Extracts on FABER244 expand the panel overcoming missing of any not yet identified or available allergenic molecule, increasing diagnostic accuracy and comprehensiveness. Test interpretation is supported by CAAM Digital Reporting System (CDRS), a unique online tool available worldwide, allowing visualization on mobile devices of FABER test results. CDRS has been developed for patients to familiarize with the new extended molecule-based results. To be patient-friendly it uses local languages taking advantage of the Allergome platform as the multi-language source. Data on CDRS are shown with tables, graphs, images; comments are generated real time by experts using the Allergome and its external modules, InterAll and ReTiME. Conclusions: FABER 244 is the most advanced in vitro test for specific IgE detection, including molecules and extracts. It makes available to the molecular allergist an unprecedented quantity of data. The inclusion of allergenic extracts is strategic to confirm or complement results obtained with the single allergenic molecules.